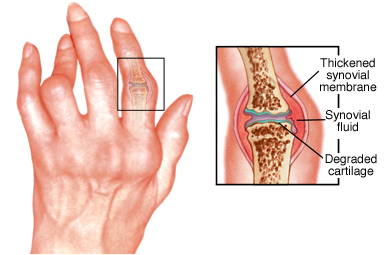 Rheumatoid Arthritis (RA) is a progressive inflammatory disease in which the body's immune system attacks the lining of the joints, called the synovium, which normally produces fluid that lubricates the joints to provide smooth movements, resulting in synovial membrane inflammation and thickening within and around the joints. 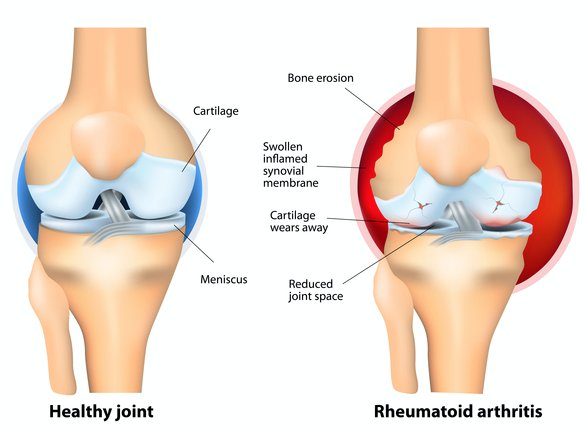 RA is one of the most common inflammatory autoimmune diseases characterized by persistent synovitis, systemic inflammation, and production of autoantibodies within the synovium. If the inflammation goes unchecked, it can damage cartilage as well as bone causing cartilage loss and narrowing of the joint space between bones over time. Joints can become loose, unstable, painful, lose mobility, and deformity can also occur. RA most commonly affects the joints of the hands, feet, elbows, knees, and ankles and usually, the effect is symmetrical. RA is a systemic disease as it affects other body systems including skin, eyes, lungs, heart, blood vessels and other organs. The cause of RA is unknown, but environmental factors, infections, poor lymphatic circulation, and genetics contribute to the condition. The first event in RA pathogenesis is the activation of B cells and T cells. The activated B cells produce antibodies that target structures of the synovium and surrounding joint tissues, autoantibodies that direct against native antibodies, most classically described as IgM antibodies that recognize the Fc portion of IgG molecules, and cytokines. Autoantibodies can form larger immune complexes that can further stimulate the production of pro-inflammatory cytokines such as TNF-? and rheumatoid factor (RF). T cells contain T cell receptors that can effectively present antigens to other T cells and create an immune response. T and B cell activation results in an increased production of cytokines and chemokines, leading to a feedback loop for additional T-cell and B-cell interactions. The cytokines produced (IL-6, IL-17, IL-1) activate genes associated with inflammatory responses, including more cytokines. This causes inflammation of the synovium and surrounding joints including cartilage, resulting in pain and swelling around and within the joints, as well as joint destruction. The increased levels of TNF-? lead to high levels of osteoclasts that resorb bone tissue and subsequently leads to bone destruction. IL-1 activate synoviocytes, which are specialized cells located inside of the synovial membrane that secrete MMPs into the synovial fluid leading to further cartilage and bone degradation. The lymphatic system plays a key role in the development of autoimmune conditions. Research results have shown that lymphatic dysfunction and the resulting decreased lymphatic circulation can induce symptoms of autoimmune conditions such as RA. 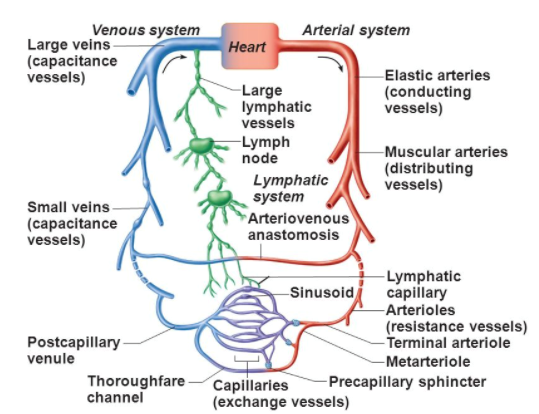 One of the primary purposes of the lymphatic vasculature is to sustain fluid homeostasis. The lymphatic vessels allow for reabsorption of fluid by lymphatic capillaries that become more organized collecting lymphatic vessels. 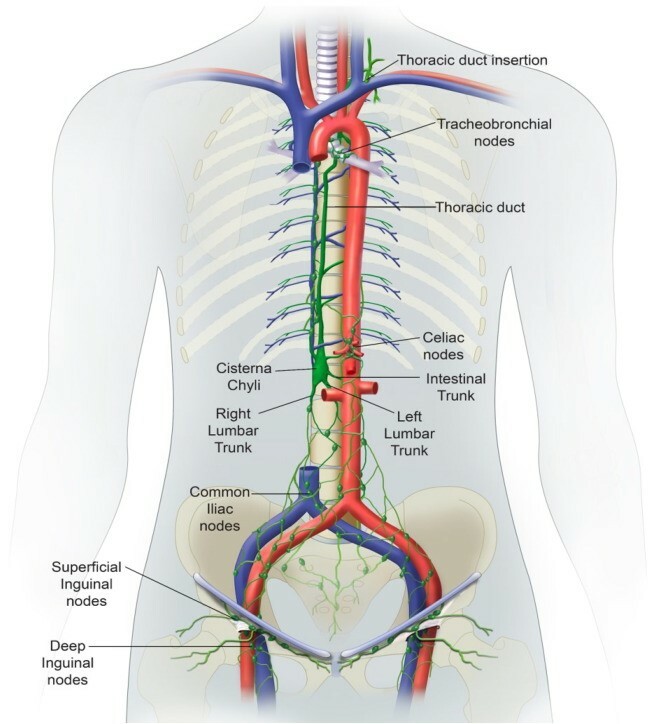 These vessels can drain to lymph nodes then collecting vessels drain lymph out from a lymph node. 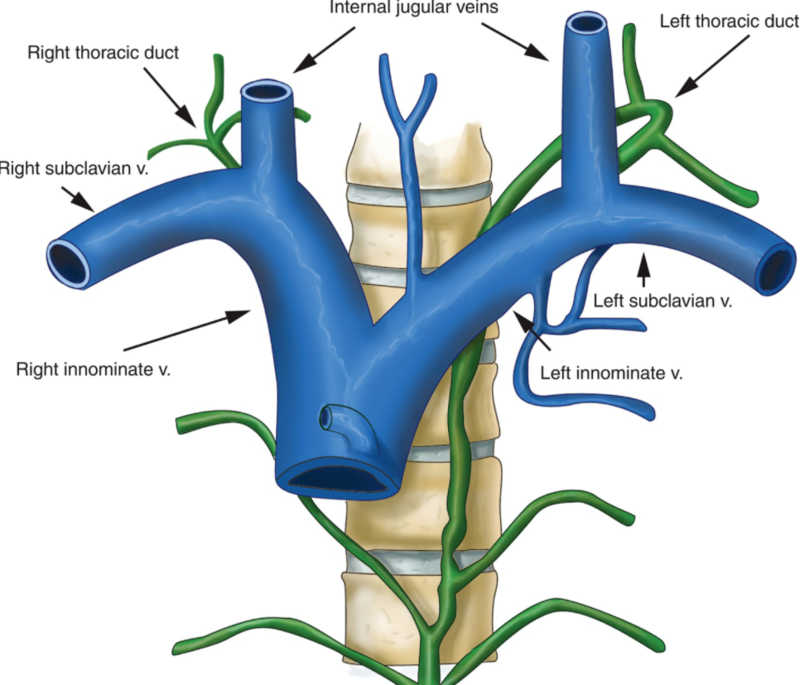 Most of the vessels and lymph nodes in this network eventually reach the thoracic duct that collects the lymph and drains it into the blood circulatory system via the left subclavian vein. 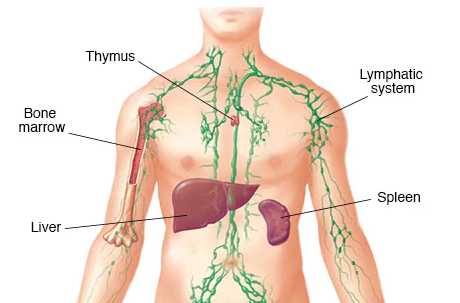 A small portion of lymph fluid is collected by the right lymphatic duct, which reaches the blood via the right subclavian vein. Lymph movement results from multiple mechanisms including intrinsic contraction of collecting vessels, as well as the presence of valves in collecting vessels that prevent retrograde movement and thus promote forward movement of lymph. Lymph movement also occurs via an intrinsic contraction associated with movement of lymph as boluses; the mechanisms underlying and regulating this contractile activity remain unclear and are an area of intense study. It has been proposed that effector lymphocytes in lymphatic fluid were significant to RA pathogenesis. Supporting evidence was the striking improvement of joint symptoms in RA patients who underwent drainage of the thoracic duct. A cohort of 9 women with untreated RA aged 24 to 65 years old who underwent insertion of a fistula into the thoracic duct and drainage of lymphatic fluid. Cells were removed from the fluid and reinfused. Within 1 week, the researchers documented improvement in the number of tender and swollen joints, decreased morning stiffness, and improved grip strength. Both B cells and T cells are produced in bone marrow, but B cells mature in the spleen and T cells mature in the thymus. Both the spleen and thymus are key organs of the lymphatic system. Lymphatic dysfunction and poor lymph quality may affect the B cells and T cells maturation and cause their loss of self-tolerance. The potential importance of lymphatic function as a key variable in RA symptoms is supported by the presence of palpable lymph nodes and lymphedema in some patients, and by preclinical data demonstrating major alterations in draining lymph nodes and vasculature prior to arthritis onset. Using MRI and ultrasound, researchers further examined the role of the lymphatics in RA and have shown that the lymphatic flow and contraction frequency in RA patients have been impaired. Slowed lymphatic circulation may cause an accumulation of excessive cell debris and protein fragments which could cause a loss of self-tolerance of the immune system as well as trigger immune system activation. This is in line with our clinical observation that RA patients usually experience an early sign of body heaviness especially in the lower extremities before an initial diagnoses. Clinical evidence also shows associations of infections as a risk factor in the development of RA. A study done by researchers of the Annals of the Rheumatic Diseases found that mice injected with Mycoplasma arthritidis developed RA 7 days later and presented with the RF antibody 14 days after injection.1 Other microbes, like Porphyromonas, have also been shown to induce autoimmune arthritis in animal models 2. The infection by the intracellular microorganism such as Mycoplasma arthritidis may cause the infected cell to be antigenic and attacked by the immune system. The liver also plays an important role in immunological activity. The liver has a much more powerful innate immune capability versus the blood due to its enriched macrophage content and natural killer cells. The liver produces suppressor T cells that control T cell activity. A liver deficiency can result in poorly functioning suppressor T cells and subsequently attribute to autoimmune conditions. RA patients are usually taking immunosuppressant drugs such as methotrexate in which prolonged use of these drugs can affect the liver and disrupt liver function. Elevated liver enzymes and severe liver damage has been documented in RA patients less than one year after starting RA medication 3. Clinical observations have found that when a liver deficiency presents in RA patients, joint deformity usually occurs.